What are some of the benefits we offer? Great experiences and wonderful memories! Schools, and jobs for that matter are like clothes. Different sizes, materials, and styles meet the needs of different people. We encourage educators to take a close look at our history, current faculty and staff, and most importantly our vision when deciding if AISN may be a good fit for you. Contact us at director@aisnmauritania.com for further information. 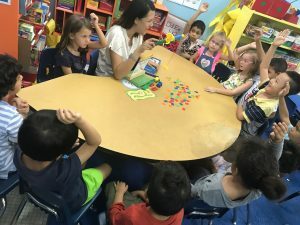 Due to increased enrollment, AISN may have an opening for a locally hired preschool teacher for the 2019-20 school year. We are looking for a passionate and dedicated preschool teacher to create a safe, caring, nurturing environment where young children will grow and develop socially, emotionally, physically, and intellectually. The ideal candidate will have a minimum of two years’ experience in early childhood education, hold a Bachelor’s degree in education or a related field, enjoy working as part of a team, and be a positive thinking, enthusiastic, and patient native English speaker. To apply, send a letter of interest, resume, and the contact information of 3 references to MaryAnn Przekurat at director@aisnmauritania.com.